The tasty tubers, or root vegetables, of the Jerusalem artichoke may make for a nice side dish, but the plant is considered a major invasive species in Europe. Understanding how invasive plants evolve and the genetic underpinnings that enable them to thrive in a new environment is key to better understanding why they are wreaking havoc on natural landscapes and food production around the world. "The production of a large number of tubers is a major driver of invasion success in Jerusalem artichoke," said Dan Bock, lead author of the study who completed this work as part of his PhD in botany at UBC. "Moreover, we can see that this trait evolved multiple, independent times in invasive populations." The plant, a member of the sunflower family, is native to central and eastern North America and was introduced to Europe in the early 17th century, where it was cultivated for food. Once potatoes became the more desired crop, the Jerusalem artichoke was left to its own devices and spread, pushing out native plants especially in water-rich ecosystems along rivers. It is now one of the most common invasive species in Europe. "In countries of Central-Eastern Europe including Romania, where I am originally from, the plant is very common," said Bock, who is now a postdoctoral fellow at Harvard University. "Oftentimes, patches of invasive Jerusalem artichoke look like huge cultivated fields that extend as far as the eye can see." For this experiment, researchers planted over 700 invasive and noninvasive Jerusalem artichokes in a controlled plot at UBC's Vancouver campus. Once the plants reached maturity, they recorded and compared a number of characteristics. One of these, the number of tubers, was always extreme in invasive populations. "The results of this research are important to our broader understanding of how and why some plants become successful invaders." said Loren Rieseberg, professor in the department of botany at UBC and Bock's graduate advisor. When the researchers paired genetic analyses with these measurements, they found that this trait had evolved independently more than once. Bock says they identified at least four independent genetic origins, meaning that invasiveness can evolve repeatedly. "It is interesting that a single trait is driving invasion success," said Michael Kantar, a co-author of the paper and former UBC postdoctoral fellow who is now at the University of Hawaii. Invasive species are a major concern for many regions because they are difficult to get rid of, they displace native plants and they can interfere with food production. Previous research estimated that invasive species of all types - plants, insects and pathogens - cost the U.S. more than $120 billion annually. It's also common for invasive species to take over areas that have abundant resources. In the case of the Jerusalem artichoke, the resource is water. 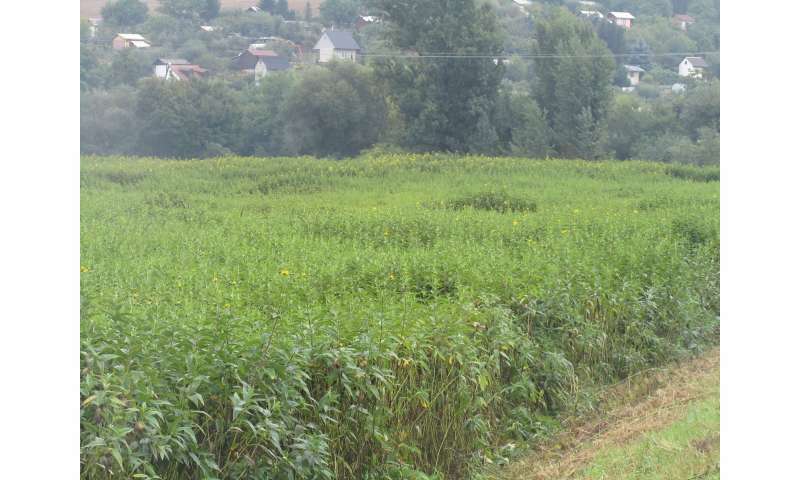 In Europe, this invasive plant pushes out native plants along river courses and in the U.S., it's a weed on farm fields. "We tend to think evolution happens very slowly but here, we're seeing evolution in real-time," said Kantar. "It's interesting to really understand how plants and people are constantly interacting; a lot of this invasion happened in the last 100 years because of our actions." The researchers say the findings could one day be used to help control invasive species and may help prevent other species from becoming invasive.